Julia Krueger drops into the apartment of a fellow resident of The Danish Home of Chicago to admire her neighbor’s beautifully blooming tulips. They chat amicably as they regard the bright yellow harbingers of spring. From there, Julia strikes up a conversation with Linda Steffensen, development manager of the boutique senior living community’s fundraising vehicle, The Danish Home Foundation. Both are excited about a summer outing to a Chicago Fire soccer game, complete with tailgating and a Danish goalkeeper. It is this easy camaraderie among residents and staff that Julia treasures at The Danish Home, where she has lived for the past six years. Introduced to the Home by way of a luncheon to which she was invited by a friend, Julia knew the 127-year-old community in the quiet neighborhood of Norwood Park felt right. A retired home economics teacher of junior high students in Skokie for 35 years, the former Park Ridge resident is in touch with friends outside The Danish Home as well. A member of Delta Kappa Gamma (DKG), a professional society for women educators, she still socializes regularly with co-members as well as a smaller group of fellow retired teachers. Julia is also an active participant in PEO, a philanthropical organization that funds educational opportunities for women. Indeed, charity plays an important role in her life. She is proud of the help her associations have offered, such as DKG’s funding of shallow wells with clean water to underprivileged people across the world. Closer to home is The Danish Home’s charitable support of a no-kill animal shelter in Marengo, Illinois, which Julia is happy to note. The willing volunteer also lends her benevolent spirit to events at The Danish Home, such as Summerfest, and works in the community’s sundry store. 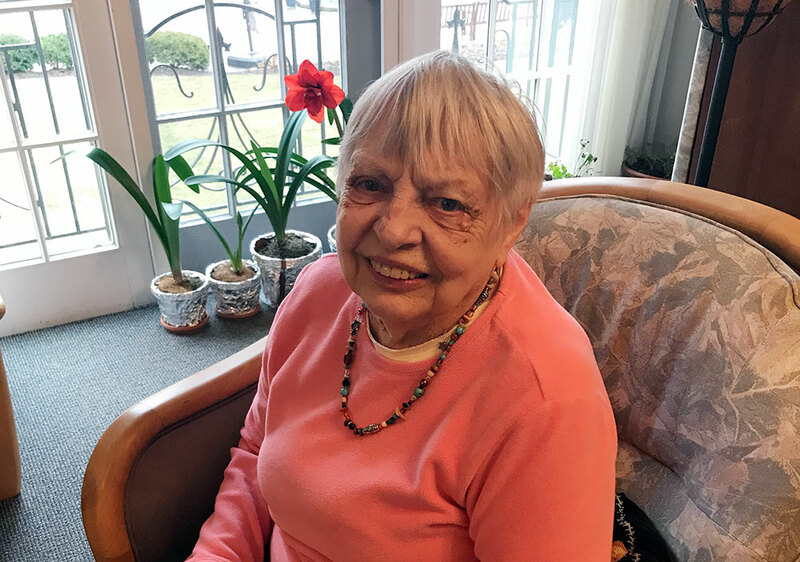 While her failing eyesight precludes her from sewing any longer, Julia doesn’t let it keep her from enjoying The Danish Home’s many outings and activities. She especially enjoys visits to Chicago’s fine museums. “This is a very pleasant place to live and thrive, and the food is too good. I have to ask for half-portions!” she said. Not to worry; Julia is a daily participant in The Danish Home’s fitness offerings. A boutique continuing care retirement community in the quiet Chicago neighborhood of Norwood Park, The Danish Home offers residents a secure, caring environment with all the comforts of home. Founded by 12 pioneering women with a vision to assist older adults who’d emigrated from Denmark to work and live out their lives in America, the senior community warmly welcomes all who cherish Scandinavian values and customs. In addition, we have a number of young people visiting the community on a regular basis, assisting in programming, performing, and more! There’s almost a constant infusion of youth on our campus!